If all the Pontiac Trans Am had going for it was the 305 pavement-warping horses, it would still be one of America's most desireable cars. But the hottest Firebird also manages to set an agressive exterior-design benchmark and rolls on an uncomplicated, well-executed, track-tuned platform. Mash the gas and it will romp 0-60 mph in 5.7 seconds and eat the quarter mile in 14.0 seconds at 101.9 mph. 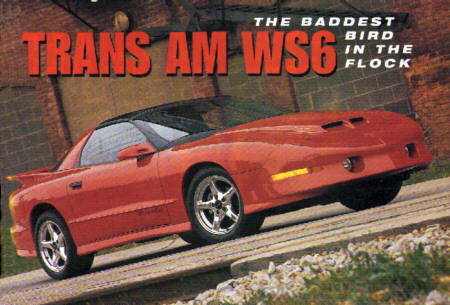 The Trans Am WS6 is automotive eye candy. Out test car's flippant exterior design and retina-searing red paint elicited hoots and waves from the sidewalk gallery. And coming up in the rear-view mirror or flashing past with the exhaust pipes rumbling, the Firebird's exterior puts fellow drivers on the instant alert. Sporty and functional describe this Firebird's interior theme. The cockpit has an all-business quality with its four-spoke steering wheel, simply semicircular instrument pod, port-hole-style dash vents, and modular radio and climate controls. The only interior feature that could use some help is the bucket-seat styling; the bottom cushions feel too thin and the bulging backrest contours are never quite in the proper place. Of course, having all that underhood muscle would be no fun if you couldn't turn and stop. The Trans Am WS6's steering orders are transmitted by an ultraquick 14.4:1, power rack-and-pinnion unit. Up front is a beefy short- and long-arm suspension with coils and a big 30-millimeter anti-roll bar. The rear suspension consists of a giant live axle supported by a torque arm, trailing arms, a track bar, and high-rate coils. Stopping from 60 mph takes only 124 feet thanks to the brawny four-wheel-disk anti-lock brakes. A Z28 Camaro may provide similar performance, but with twice as many Chevys as Pontiacs on the road, the Trans Am WS6 is a much rarer bird to pilot.